Our range of products include safety wheel chock, wheel chock, rubber wheel stopper, dock bumper, hose ramps and abs wheel chock. 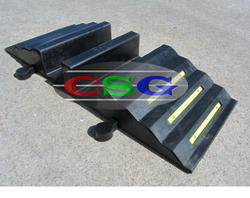 We are the leading supplier of Safety Wheel Chock. Clients can avail the products at best market prices. Injection Moulded from durable U.V. stabilized and chemical resistant plastic this wheel chock is both tough and lightweight. 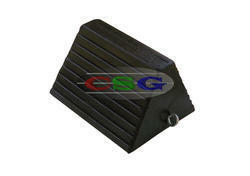 We have also included Antiskid rubber blocks to our Wheel chocks (3.00 to 3.250 Kgs. Maximum with rubber block & wheel Chock). We have come up with this Light Weight ABS Wheel Chock which are mostly used for Light Commercial Vehicles and known for its optimal design, easy installation and easy-to-use. We have been known for manufacturing , exporting and supplying of of this supreme quality of Loading Dock Bumpers which is used in protection of loading bays . 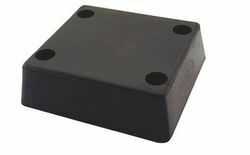 The provided Dock Bumper is manufactured using optimum quality rubber and the latest technology which are in strict compliance with industry norms. Our engineers test this Dock Bumpers and Fenders on various parameters which counts for durability of product .Our clients can avail it from us at affordable prices . We are offering Hose ramps and Protectors to our esteemed clients, manufactured using qualitative components. These Hose Ramps are Protect Hoses which prevent bulges and line backups in high traffic areas. Hose Ramps provided by us features latest design and construction technology and is guaranteed to prevent vehicles and pedestrians from accidentally interfering with your hose lines or large cables. These are heavy-duty materials and bright yellow colour reflectors make these the most durable and visible fire hose ramps in the market. 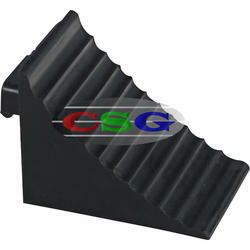 Our product Rubber Hose Ramp is well known for its convenience to use, high strength, lightweight and high durability. Injection Moulded from durable U.V. stabilized and chemical resistant plastic this wheel chock is both tough and lightweight. The Chock comes with ergonomically Moulded-in handle. 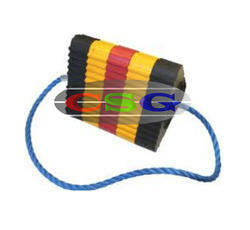 We have introduced a new product in our product line of wheel chocks. This Wheel Chock with stand is made of MS material. The stand comes for 1 wheel chock as well as 2. It has rubber grips on the handle for easy movement. The stand comes with wheels to move around conveniently. 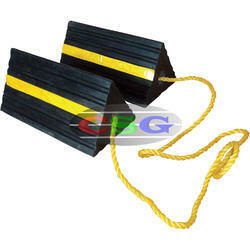 Wheel Chocks used are manufactured from high quality natural rubber. 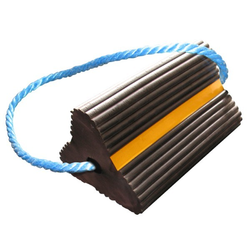 The rubber used resists tearing, abrasion, etc. It has rubber composition of 70% - 80% natural rubber and additives. 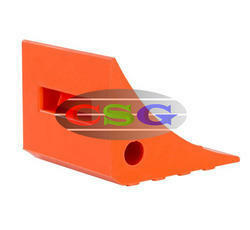 Application:Wheel chock stand have 50 mm diameter powder coated rod. The wheels are light weight and have the strength to support the weight of heavy duty trucks, HGV, Off highway vehicles while the chock rest of its triangular or square point. 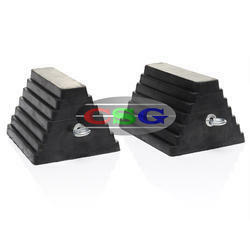 We are the leading supplier of Pyramid Wheel Chock. Clients can avail the products at best market prices. 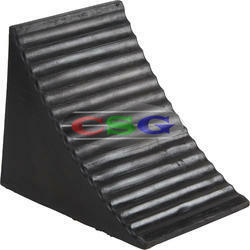 We are long-time established manufacturer, distributor, importer and exporter of C-Shape Wheel Chock. We are among the prestigious names in the industry, engaged in offering Triangular Wheel Chocks to our valuable customers. 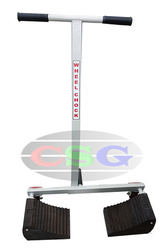 Our Wheel Chock is known for its optimal design, easy installation and easy-to-use. With more than two decades of experience in the field of Industrial Safety Products, we have emerged as a respectable leader for the supply of Medium Aircraft Wheel Chock. 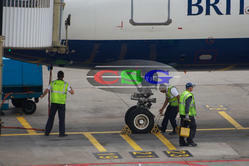 Usage Used for heavy vehicles like Aviation Fuelling Vehicles. 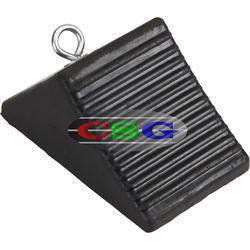 We are long-time established manufacturer, distributor, importer and exporter of Heavy Duty Wheel Chock. 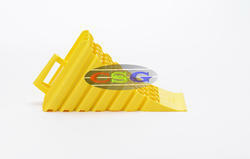 We have over two decades of vast industrial knowledge and experience in producing superior quality Curved Wheel Chock. The basic materials used in manufacturing C Shaped Wheel Chocks are well tested by our testing team to ensure its safety. Our engineers and the technical team also provide customised designs Wheel Chocks as per customer requirements and applications. We are among the prestigious names in the industry, engaged in offering Small Vehicle Wheel Chock to our valuable customers. 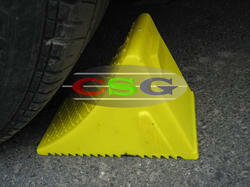 We are known for offering a wide range of Triangular which stands on its design, strength, and reliability. We obligated to meet the quality standards as per the customer demand. Looking for Wheel Chocks ?